Are discount CCTV cameras any good? Is £20 for a CCTV camera a bargain or a false economy? You see them all the time; CCTV cameras pop up on discount sites such as Groupon, Wowcher etc for staggeringly low prices, often as low as around £20 which seems like a great price to pay for something that could keep your home secure but when there’s a price difference of hundreds of pounds how do they really compare to a professionally sourced and installed system and do you get what you pay for? It might be that a super-cheap camera such as these ones, or even ones that cost a bit more, are suitable for your needs but you do need to be aware of the common pitfalls so that you can make an informed decision. 1. Can it be used externally? Many of these low cost cameras are actually for internal use only but you have to read the description carefully to know this as it may not be immediately obvious. We recently saw one that didn’t make any reference to where it could be used on the offer page, it was only by clicking on the link to the selling partner’s site that it stated it was for use as a pet or baby monitor and even then it didn’t specifically say it was for internal use only. It would therefore be easy to assume that it could be used outside the house when in fact it would not be suitable for external use. An external camera obviously needs to be weather and tamper resistant so is more expensive to manufacture. 2. What does it record to, if indeed it does record? A large element of the cost of a professional system is the DVR, or digital video recorder. This is a remote hard drive unit, usually connected by a cable to the cameras, that records the images and stores them for up to a month. Often with the cheap cameras, you can log in via an internet enabled device but they’re not necessarily recording. If they are, it’s usually on an SD card which might have limited memory. Not only could this limit the amount of footage you could record but it could also compromise the quality of the images. A DVR on the other hand, stores the footage for longer and enables you to review it on a monitor so it’s much easier to find what you’re looking for. The other issue you have with an SD card is that it’s stored within the camera unit itself. Steal the camera, steal the footage! Which kind of defeats the object of having one. 3. Is it truly HD? Just because it says HD doesn’t mean that it technically is. Many that claim to be HD are actually just 720p when a truly HD system needs to be at least 1080p. Always read the technical specification. This obviously affects the quality of the images and if picture quality is low it would almost certainly be no use as evidence in a prosecution and may not even be clear enough to identify individuals or events. We actually now predominantly specify IP cameras rather than analogue ones (see how they compare here) but these cheap ones definitely won’t be IP. 4. What’s the origin of manufacture? Any item of equipment that is very cheap will invariably be manufactured in the Far East and imported so you don’t really know what you’re getting. It will use low cost materials, unknown technical specifications and there may be ethical issues around the labour (using exploitative working practices). A professional system will cost more because it uses high quality equipment from tried and tested brands with transparent manufacturing processes. Even with a professionally installed system, ask to see the breakdown of cost between equipment and labour and if the equipment cost is very low, chances are so is the quality. We never fit third party equipment because we can only guarantee performance in systems that we have sourced ourselves and know to be of high quality and will last longer. 5. Do you have sufficient installation expertise? Obviously, cameras on discount sites are for equipment only so you’re expected to be able to install them yourself. 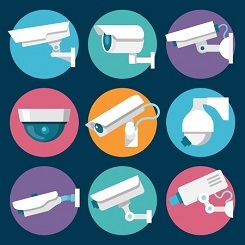 With wireless systems this should be reasonably straightforward but even without the cabling to have to contend with, there are a number of things that a CCTV engineer would bring to proceedings that a layman perhaps wouldn’t be able to. This includes designing the best positions for cameras, set up of the DVR and ensuring optimum picture quality. So, do you get what you pay for? Essentially, yes you do. A couple of low cost cameras from a discount site or your local DIY store could be fine for a bit of a deterrent in a low risk area but a properly installed, professional system will always be more effective in capturing footage that can be used for identification or prosecution and will last longer. Interested in a CCTV system? If you’re looking for something more professional than a bargain basement camera, we can often provide a quote over the phone for domestic properties and offer free site surveys for more complex systems. Call us on 0800 612 9799.